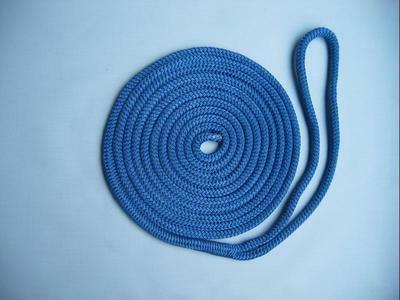 3/8" X 20 foot Nylon Double Braid Dock Line. Solid BLUE in colour. Made with 100% Nylon and professionally hand spliced with a 12" eye in one end. The other end is heat sealed to prevent fraying. Rope tensile strength 4,800 pounds or 2,181 KGS. This product was added to our catalog on Saturday 27 December, 2008.